Sensing devices are in heavy demand due to their functional capabilities such as processing, data fusion, communication, integration, and control in various applications. The concepts such as home diagnostics and home and remote monitoring are being commercialized with the development in the healthcare equipment such as portability, reduced size, and low-cost architecture facilitating disposable equipment. The report profiles all major companies active in the sensor market for consumer healthcare. This report also provides the competitive landscape of key players that indicates the growth strategy of the overall sensor market in consumer healthcare. The report also covers the entire value chain for the market from the raw material supplier to the end user. Along with a value chain, this report also provides an in-depth view on the types, applications, roadmap, and the drivers and restraints for the industry. The market for sensor in consumer healthcare applications is estimated to reach $47.40 billion by 2020 with a CAGR of 5.56% from 2014 to 2020. Some of the key players in the sensor market for consumer healthcare are Analog Devices, Inc. (U.S.), Aptina Imaging Corp. (U.S.), EPCOS AG (Germany), Freescale Semiconductor Inc. (U.S.), GE Measurement & Control Solutions(U.S.), Measurement Specialties, Inc. (U.S.), Koninklijke Philips N.V. (Netherlands), and Infineon Technologies AG (Germany). Based on the types of sensors, the consumer healthcare market is segmented into temperature sensor, blood pressure sensor, blood glucose sensor, blood oxygen sensor, ECG sensor, image sensor, posture sensors, altitude sensors, motion sensor, pedometers, heart rate sensor, radiation sensor, and touch sensor. The major applications of the consumer healthcare market include patient monitoring, therapeutic, imaging, handheld and homecare devices, and fitness and wellness equipment. The geographic market is further segmented into North America, Europe, Asia-Pacific (APAC), and the Rest of the World (RoW). There has been an increasing momentum for consumer healthcare monitoring and sensing driven by sensors with advanced features and sophistication. The consumer healthcare will lessen the healthcare cost of the patient by reducing the time associated with doctor consultation, visiting doctor and so on. Consumer healthcare sensing plays an important role in delivering reliable psychological and biometric monitoring of patients. The report provides the contributionof the sensor market in consumer healthcare with inclusive forecasts for revenue across sensor types,applications, and geography related to this market. The sensor type section in sensor market in consumer healthcare report is further segmented into as temperature sensor, blood pressure sensor, blood glucose sensor, blood oxygen sensor, ECG sensor, image sensor, posture sensors, altitude sensors, motion sensor, pedometers, heart rate sensor, posture sensor, radiation sensor, and touch sensor.Applications of sensor market inconsumer healthcare sectorincludepatient monitoring, therapeutic, imaging, handheld and homecare devices, and fitness andwellness devices.This sensor market in consumer healthcare report covers geographic regions, which are North America, Europe, Asia-Pacific, and the rest of the world. 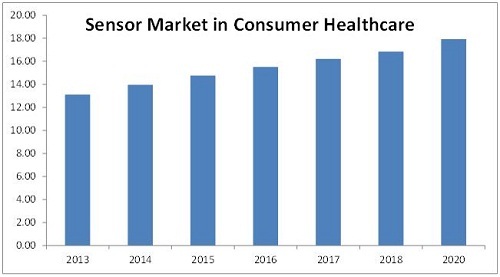 Some of the key players in the sensor market for consumer healthcare are Analog Devices, Inc. (U.S.), Aptina Imaging Corp. (U.S.), EPCOS AG (Germany), Freescale Semiconductor, Inc. (U.S.), GE Measurement & Control Solutions(U.S.), Measurement Specialities, Inc. (U.S.), Koninklijke Philips N.V. (Netherlands), and Infineon Technologies AG (Germany). The sensor market in consumer healthcare is expected to reach $47.40billion by the end of 2020 at a CAGR of 5.56%.The sensor market in consumer healthcare application is driven by the rising healthcare costs, aging population, and wide-spread diseases. The growth in the portable and disposable diagnostic equipment, increasing need for greater precision, and reliability are some of the major market drivers for the sensors market in consumer healthcare applications. 3.2 Interview With Director of Marketing, Epcos AG. 9.23 Murata Manufacturing Co., Ltd.
9.24 Proteus Digital Health, Inc.
Table 71 Company Snapshot: Proteus Digital, Inc.
Table 72 Company Snapshot: Qualcomm Atheros Inc.